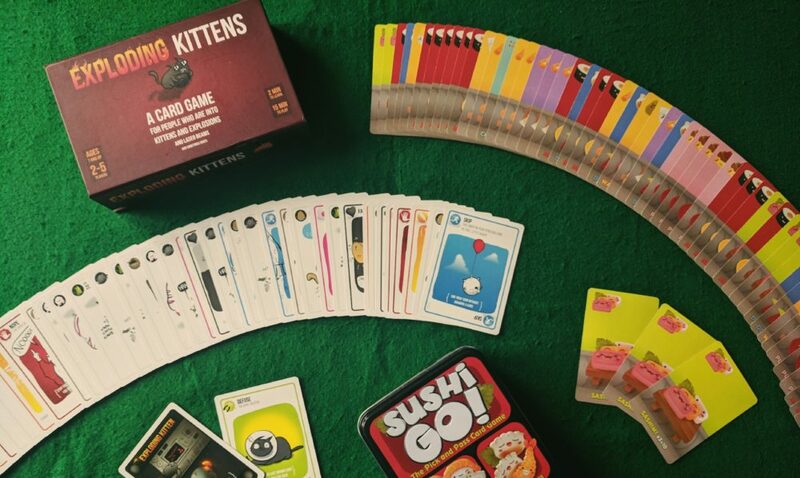 This cute game is more strategy based than you would think and takes seconds to set up. You use the sushi to build up points through combos, passing hands around the table like a sushi bar conveyor belt. The bigger the risk, the higher the score – but your friends might notice the combos’ you’re going for and sabotage you! 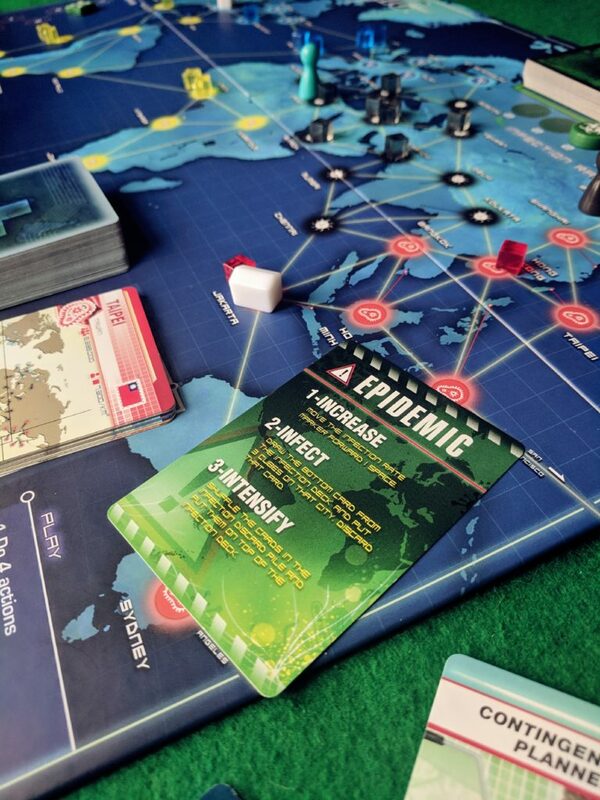 Pandemic is a co-operative strategy game in which you collectively try to save the world from being taken over by deadly diseases. This is one of the games I’ve played probably 50+ times…. For those who enjoy working as a team, or screaming at friends until they understand that your way of saving the world is best, this game is for you. This game is full of savagery comparable to thousands of tiny kitten claws! Each of you have the ability to diffuse the exploding kitten only once and you can return it to the pack wherever you want. Target the person you hate the most, or your girlfriend/boyfriend, but be careful, it might back-fire on you. This is like Cluedo but levelled up to 1000 plus a mysterious twist. The way you work out the murderer is through vision cards, handed to you by the ghost of the person who was murdered (who basically acts as the games master). This is a game of ambiguity and trying to read signs that can only be shown to you in picture form. In this game, you try to build trains across countries and continents to connect cities together – but the problem is your friends are also trying to do the same. My favourite way of proceeding with this one is “controlled chaos” – place your trains in seemingly random areas so your opponents have no way of knowing which way you’re trying to go. Can’t say it works though… I’ve never won a game. For those of you who have not played Fluxx before, as the name suggests the game’s goal and rules continually fluctuate meaning you’re never quite sure if you’re closer than anyone else to winning until suddenly, you do! The zombie version of this game adds an additional element – making sure that Zombies don’t kill you before you win. Of course, one way you could try board games out for yourself in good company, is go along to a Geek.Zone social event! 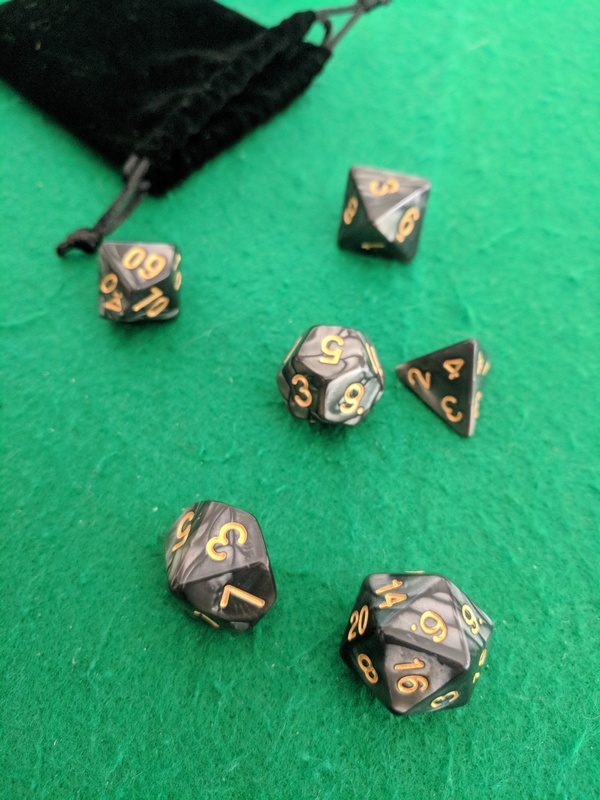 Geek.Zone are a local (Coventry) based non-profit organisation that host tons of local events, including board game nights and retro games nights. For more ideas on nerdy things to do in Coventry, check out my previous post! Oh man, Zombie Fluxx can go on forever! Definitely pick Chrononauts if you want a similar vibe but not one where the game never ends or is impossible to counter someone’s win. You need to check out Pandemic Legacy – it’s Pandemic but in a persistent world, so you play it with the same people and level up through the infections like D&D. Totally recommend if you put the time in! It can go on forever compared to normal Fluxx but I love the additional element to it. The problem is I think, people don’t realise you need a strategy to play that game and I find people just play randomly! I’ve played Pandemic Legacy! That was one of the games that I played before DnD with my board game friends. It was great but impossible towards the last games due to a string of bad decisions in previous games and a serious outbreak of the faded yellows! sushi Go! is in permanent rotation at ours. Awesome game! you need to get some Lords of Waterdeep in your life if you haven’t already. Great summaries Amy-Lou! Yes! Sushi Go! always eases us into a games night. Thank you for your comment! I will try out your recommendations! Ohh a couple of my favourites on there! 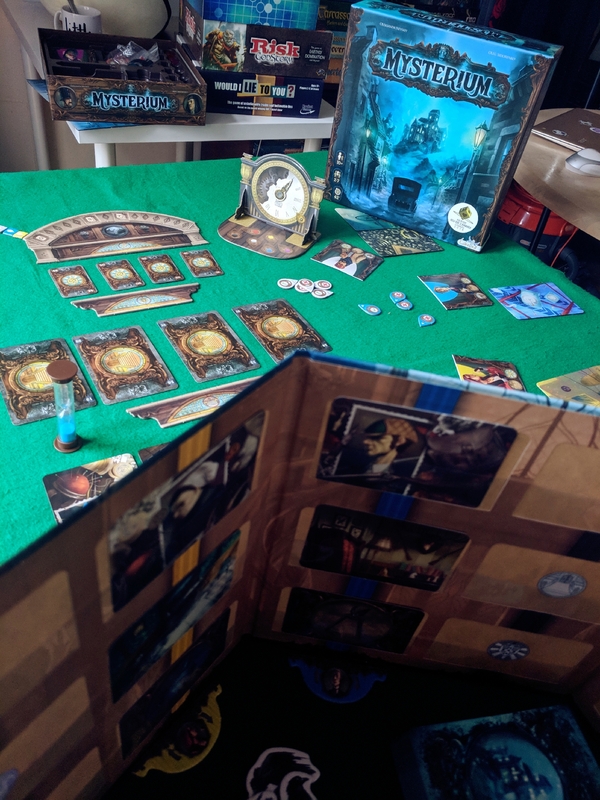 😀 I got a chance to play Mysterium at a booth at a con and a very lovely lady for the games company took us through it. It’s not quite my fiance’s cup of tea but I loved the symbolism and storytelling aspect of it. And Fluxx is a BIG favourite in our house; we have about 3 or 4 different versions including the Zombie one. I definitely recommend that as a great starter for newcomers and for non-gamer/non-geek families because it’s so easy for anyone to pick up. Thanks for your comment, Heather! I did love Mysterium and yes, I own 3 versions of Fluxx too! Zombie version definitely adds another element to it. Thanks for sharing!